Econsultancy’s report on marketing integration won’t be published until Integrated Marketing Week in June, but we wanted to preview some of the top line findings from our survey of over 1,000 marketers and agency pros. What exactly is integrated marketing? Broadly it’s the effort to have channels work together within common campaigns and programs, but that’s just the tip of the iceberg. The Integrated Marketing Survey, conducted in partnership with Target Marketing, asked practitioners to define and rank the elements of integration, the fundamental skills it requires and the challenges it presents. We’ll look at all of these over the next few posts leading up to #IMW13 (follow that hashtag for info on integrated marketing and the event), but first up are the basic components of marketing integration, and the key factor in why many companies aren’t successful in implementing them. Brand means a lot of different things and includes some of the other parts of this list. For example, one can argue that there’s nothing more integral to a company’s brand today than customer experience. But we’ve separated these threads to look at each in more detail. In this context, brand experience means the visual brand and how well companies use images, colors and logos to portray who they are in a complimentary way across channels and experiences. One of the most nuanced parts of an integrated campaign is messaging/promotions. That’s because it’s not as simple as using the same copy and offers. On the contrary, different channels, devices and audiences often demand unique treatment… all within a complimentary context. The sum total of what it’s like to read, view, interact or shop. What elements should be common across channels and what should be unique? How far do you go with time and money limitations? If only 7% of your traffic is mobile, but you know that it might be a very important audience, how do you invest for the future? Fielding integrated marketing campaigns that include offline elements with long lead times can be like planning D-Day. Even multichannel campaigns which are online-only can be complex as the agencies and various vendors come into play. Also, timing doesn’t always mean that everything happens at once; it’s not uncommon for campaigns to have a gradual roll out across channels. Unified data means having technologies and processes that speak the same language. It’s a goal that’s been a thorn in the side of marketing, especially as digital has expanded the channels that produce data and the silos that hold it. But it’s also the central promise of digital marketing technology, and fortunately the tools for unification are becoming more effective and more economical as they move to the SAAS, cloud-based model. There are many reasons for unifying data and benefits to doing so, but one of the most important within the context of an integrated campaign is that current customers are known and cherished and sold to very differently from new prospects. We all know the statistics, the models and the conventional wisdom… the customer journey is complex and marketers need to understand how the panoply of channels contribute to the end result. It’s not easy, and the complexity rises with every channel that’s added. But in the end, we’re not just learning what works, we’re learning about our customers and how they use those channels. These are the components of successful integrated marketing. Campaigns that do some or all of these things well are likely to be powerful and make more money than campaigns that exist in the vacuum of a single channel. As we examined the data around making integrated campaigns a reality, one correlation stood out; companies with political barriers were far more likely to be failing. The chart below compares organizations that marketers describing as having “internal political barriers” and those that don’t. The differences are stark. With the exception of “coordinated timing” there’s a enormous delta between the two groups; organizations with political silos are two to three times more likely to describe themselves as failing in a given area. A silver lining from the study is that conducting integrated marketing does correlate with improved relationships between channel teams. 62% of agency respondents (who are typically quite critical of client side orgs) agree that political issues are abated by practicing integrated marketing. What’s more difficult to determine is what’s the chicken or egg in this scenario. Anyone with big company experience knows that simple repetition isn’t enough to work bad processes out of a system. But this statistic does underscore the value in pushing ahead, of setting the goal of integration and doing whatever it takes to make it happen. Changing internal company dynamics can be the most challenging task leaders take on, and there are whole books and companies devoted to nothing else. But if there’s a simple truth, it’s that everything eventually comes down to incentive, because that’s where human nature and business reality meet. If you are paid or recognized for something that’s not in line with integrated marketing, you’re not going to be a big help. In fact, you might even work against it (your brain will come up with a good reason why, don’t worry). Organizations that want to integrate across channels, bring down silos or focus on the customer have to start by making working together to a common goal the basis of their compensation/incentive models. Next week, we’ll look at the role of technology in integrated marketing. To get the entire Integrated Marketing Study, join Econsultancy and the DMA at Integrated Marketing Week, June 10-13 in New York. The perennial business problems of budget and resource availability are the main barriers to adopting or improving testing processes, according to a new survey by Adobe. Just under half of respondents said that budget (45%) and lack of resources (42%) were “very challenging” problems when it came to testing, while “knowing how to test effectively” is the third most challenging area (37%). But these results are unsurprising when compared with the report’s broader findings. The data shows that a majority of companies (53%) spend less than 5% of their total marketing budgets on optimization activities, while a further 49% of respondents stated that testing is not a priority at their company. 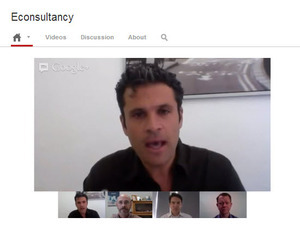 Last Wednesday, Stefan Tornquist (VP Research, US at Econsultancy) moderated a lively discussion on Measurement, Analytics, and Attribution that quickly maxed out the attendance capacity of the Hangout. I was joined by digital analytics gurus Jim Sterne (founder of eMetrics Summit & Digital Analytics Association) and Tom Cunniff (founder of Cunniff Consulting) to discuss what marketers need to do beyond gathering information, and how to apply measurement and analytics to strategy across the business. 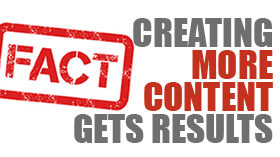 As a content marketing agency, we are always telling people what a vital role content plays in driving all elements of your digital marketing, be it social media, email marketing, SEO etc. The good thing is that most people get this now. We seem to have moved past the educational phase with more and more companies publishing fresh content on their websites on a regular basis. What we wanted to demonstrate, however, was the significant impact that an increase in content output (that is still high quality and original) can have on some of the key digital marketing metrics, such as website traffic, search engine rankings and social media reach.